According to Beck, the Muslim Brotherhood and like-minded groups would take advantage of instability in an effort to reestablish the caliphate. The caliphate, which ended over 400 years ago, for Beck obviously represents something dangerous. It seems that if Muslims unite it is frightening and sinister, but if Western powers unite it is entirely different. Islamophobia? The caliphate emerged after the death of the Prophet Muhammad. When he died, Sunnis believe that he did not designate a political leader for the community. It was incumbent on the community to choose a leader, a caliph, from among themselves. The followers of Ali who became the Shias, on the other hand, believe that the Prophet designated Ali as the leader. The first caliphs–Abu Bakr, Umar, Utman, and Ali–are referred to as the four rightly guided caliphs. After the four rightly guided caliphs, the caliphate moved to different capitals as it spread and different leaders emerged. The territory under Muslim rule eventually stretched westward from Arabia across North Africa reaching Spain and eastward across Central Asia reaching the Indus Valley. Although there are Muslims who might like to see the return of the caliphate–a united political-religious state run by Muslims–most recognize that the Muslim community worldwide is incredibly diverse and that such a proposition would be unlikely. As such most would rather establish democracy in their existing countries. This was made clear in the Egyptian revolution, where religion was not the focus at all. In fact, Muslims and Christians together had a clear message: Hosni Mubarak must go. While the Muslim Brotherhood participated in the protests, they were by no means the central players. Looking at other uprisings in the Middle East, religion is not even part of the equation. I think for people like Beck employing terms like “caliphate” and “sharia law” works to conjure up fear, but they do not reflect the realities on the ground nor do they address the incredible complexity and diversity of the world wide Muslim community. While the caliphate represents a golden age for Muslims, it doesn’t mean that they are looking to the past for a solution. In fact, their focus is towards the future–a future with democracy. 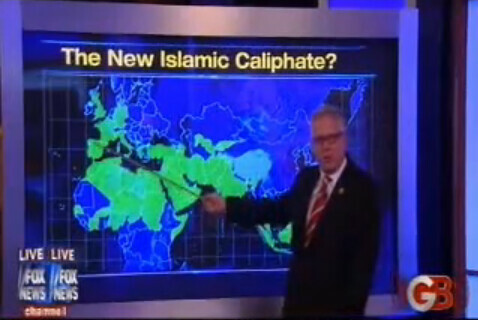 What do you think of Beck’s theory on the caliphate? Why do you think there is a fear of Muslim state? Do you think Muslims would like a caliphate? Please share your thoughts below. This entry was posted in Islamophobia, Middle East, Politics and tagged #Egyptian Revolution, #Muslim Brotherhood, #SSRCWCG, Caliphate, Glenn Beck, Tunisian Revolution by Reem. Bookmark the permalink. I’m always eager to support a caliphate……….